The proverbial handful of rice became, briefly, a reality for students and staff of St Philip’s College in Alice Springs. By far the largest group, 76% of the 600 students taking part, had nothing else for lunch yesterday: eating just boiled rice, they represented the third world populations who mostly go hungry. A second group had McDonald’s fare – hamburger and icecream: they represented the well-fed first world. It was the smallest group, 7% of the participants. And the group in the middle, 17%, had fried rice with vegies. This World at Lunch initiative was organised by Year 12 students Jessica Sullivan and Caroline McClure and members of the Senior Round Square Committee. It made us aware how lucky we are, and we should all do more to help, said the students the Alice News spoke to. Some encouraged other schools to hold a World at Lunch as well. 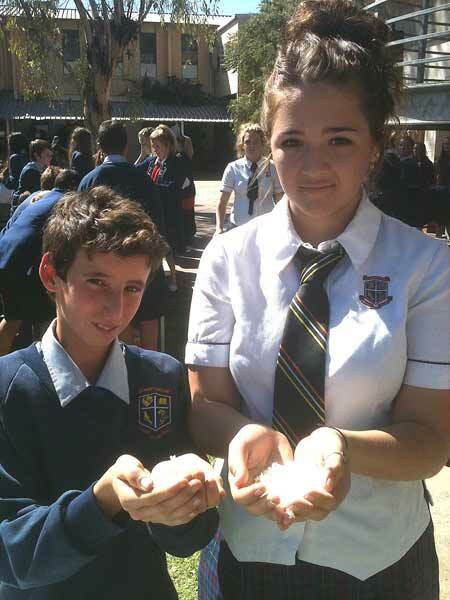 PICTURED are Ross Cairns, 13, and Round Square Prefect Caroline McClure, 17, with their handfuls of rice.